You think we don't know what you're thinking? We've got the pictures, too - and we're willing to admit that these men's shoes look a little bit like clogs. But, we promise, the KEEN Utility men's 1006983 PTC slip-on shoes aren't manufactured with any wood at all. ... (see full details) (see specifications) #KEN1006983. You think we don't know what you're thinking? We've got the pictures, too - and we're willing to admit that these men's shoes look a little bit like clogs. 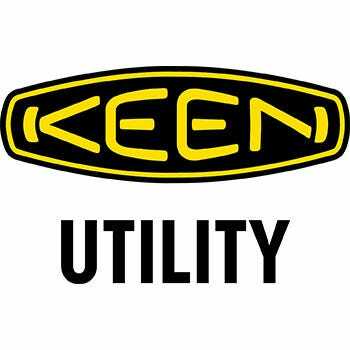 But, we promise, the KEEN Utility men's 1006983 PTC slip-on shoes aren't manufactured with any wood at all. That curvy, cloglike style cradles your feet, and if the profile is a little bowed that's because it's the shape feet make as you step. These all-black slip-ons have so many features, KEEN Utility decided not to add laces so we would have room to list everything else they've got. The black uppers are manufactured with soft, flexible leather that's stain-resistant and waterproof to make your life easier. Leather lining inside the KEEN Utility shoes creates soft, durable interiors. Side gores add extra room and flex for feet as needed. These will help give your feet a comfortable fit. Lightweight polyurethane and contouring memory foam in this slip-resistant footwear were used to create the cushioning footbeds. Polyurethane helps resist shock, while the foam gently moves and molds to feet. EVA foam has been compression-molded into the sturdy midsoles to create another lightweight layer of cushioning. Non-marking rubber soles support every step with a gripping tread tested for ASTM F1677-96 slip-resistance. Oil-resistant protection guards the rubber against corrosive chemical materials. Don't judge these KEEN Utility 1006983 PTC slip-on water-resistant shoes on pictures, because we could never show you all the comfort these shoes have to offer. Go ahead and try out a pair today, just click add to your cart and your good to go. This was previously listed as KEEN Utility style U312 22. Work 10 hr plus shifts and my feet NEVER hurt. I agree, these are the best shoes, better than Danskos. I'm on my feet 12 hours a day,. These are the best! Like the other reviewers said these shoes are really comfortable! I'm on my feet for 10-12 hours a day and needed something comfortable that wouldnt have me out of commission by the end of my work shift! highly recommend these Keen shoes. I love that shoes shoes are slip ons, coming home from a long day it is so satisfying pulling these babies off and plopping on the couch! Awesome shoes for the kitchen..Better than danskos, berkenstock and all the rest of the competition..Expensive. Mine Last about 6 months of hard use before deteriorating. I wouln't buy anything else in my opinion. Its like having slippers on at home. KEEN Utility 1006983 Men's PTC Slip-On II Work Shoes is being added to your cart.